Gardaí at the scene of the fire. A FATHER-OF-THREE whose partner and children were badly injured in a suspicious fire in Dublin this week is to be allowed out of prison to visit them in hospital. Michael Lynch (33) was granted compassionate bail at Dublin Circuit Court today to visit his critically-ill seven-year-old daughter tomorrow in the Intensive Care Unit of Temple Street Children’s University Hospital. He will also visit his eight-year-old son, who is in a serious condition in intensive care at Our Lady’s Hospital for Sick Children in Crumlin. Lynch’s partner Maggie Greene also remains in a critical condition at St James’s Hospital after the blaze broke out at the flat in the Inchicore area at about 11pm on Monday night. 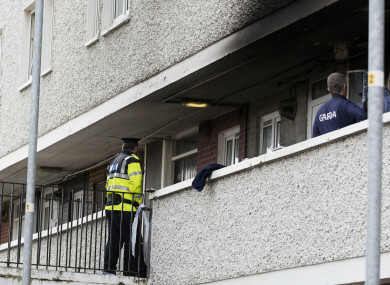 She and her three children were rescued from a first-floor balcony after five units of Dublin Fire Brigade attended the scene at Tyrone Place, Thomas Davis Street. Gardaí are treating the fire as suspicious. The couple’s eldest child, 13-year-old John, was released from hospital the following day with minor injuries. Lawyers for Lynch told the court on Wednesday that Ms Greene’s condition was “touch-and-go”. Orla Crowe SC, defending Lynch, said he had visited his partner “for four minutes” at St James’s Hospital during the week, at the discretion of the authorities at Cloverhill Prison, where he is currently in custody. The court heard that Lynch had not succeeded in visiting his daughter at Temple Street as hospital staff had objected to him being there in handcuffs, with prison officers. Ms Crowe said that both sides of the family were hoping that “if the children hear their father’s voice, it will help them and lift them towards recovery”. Lawyers for the State had objected to bail on the grounds that Lynch has 121 previous convictions, including 16 for failing to appear in court. Garda Tyrone Houlihan told the court that the Garda Pulse system has recorded a total of 26 bench warrants taken by Lynch, although this figure is disputed by the DPP. Most of Lynch’s previous convictions are for road traffic offences, but they include 16 burglary charges and others for handling stolen goods, robbery and possession of articles. He pleaded guilty in June to committing theft at Fairfield House, Newbridge Avenue, Dublin 4 on February 26 this year, while on temporary release for separate charges. He’s to be sentenced for this, with the charge of false imprisonment to be taken into consideration, on October 6 next. Judge James O’Donoghue said that given Lynch’s “litany” of previous convictions, the number of warrants and his back history, the court would normally refuse bail. However he said there were “hugely unusual” and “extenuating” circumstances and that the situation was “particularly grave” because Ms Greene was in a very critical condition. “I hope your client is aware of the court’s indulgence… that this is very much out of the ordinary…he’s very lucky to be given this compassionate bail,” said the judge. Lynch, with an address at Emmet Place, Inchicore, wiped tears from his eyes and told the judge he appreciated it. Judge O’Donoghue said his bail was confined to the children’s visits, with strict conditions attached, and that it was up to the prison authorities to decide whether to allow Lynch visit his partner again on humanitarian grounds, but added that he hoped they would “adopt the same approach”. A sister of the accused, Anne Lynch, told the court that she would collect her brother at 12 noon from Cloverhill, bring him to the two children’s hospitals and drop him back to prison by 7.30pm on Saturday, on the understanding that if he failed to return, the family would lose the €500 cash bail they had put up. Referring to the fire, Judge O’Donoghue said he was “very sorry” to hear what had happened, and extended his sympathy to all concerned, adding, “I hope they survive”. “I wish your children well, Mr Lynch,” the judge concluded. Email “Prisoner whose family were injured in suspicious fire granted compassionate bail to visit them”. Feedback on “Prisoner whose family were injured in suspicious fire granted compassionate bail to visit them”.